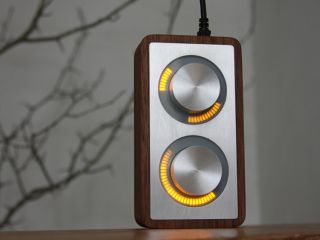 monome arc: simple and beautiful. The monome has been the hi-tech hipster's choice of controller for several years now (in fact, it set the trend for grid-based devices) so it'll be interesting to see what fans of that product make of the new arc. This does away with the buttons and contains just knobs - either two or four of them. Designed to sit alongside rather than replace the monome, the arc features encoders that are ultra-high resolution and double as push buttons. Each one is surrounded by a high-density variable-brightness LED ring. The question, of course, is what the arc might be used for? The answer will come when people in the monome community start writing software to support it, for the hardware is very much open and configurable. No price or release date as yet, but monome says that these details (and others) will be forthcoming.